Two very important stories came across our radar this weekend that led to this story. 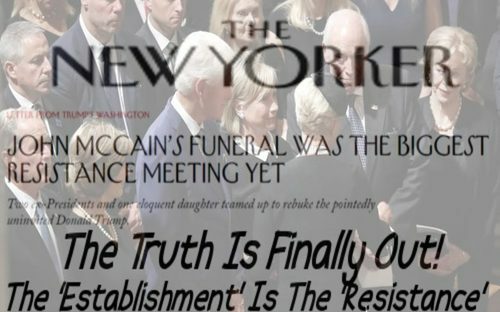 In the first from Spiked-Online titled “Now We Know: The ‘Resistance’ Is The Establishment“, they perfectly illustrate for us America’s present day situation where people like Barack Obama, Hillary and Bill Clinton and George Bush endlessly trash talk President Trump at John McCain’s funeral (finally!) while considering themselves ‘the resistance‘ according to this New Yorker story. Yet going back decades, they were THE establishment! 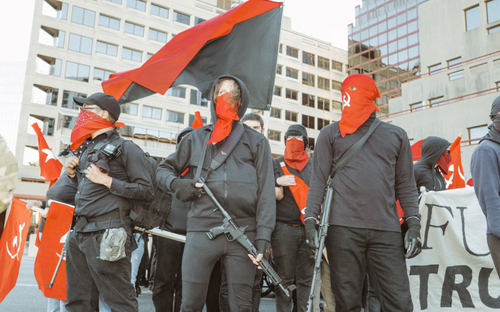 The second story, which ties in perfectly with the first, from The Truth About Guns, was titled “The Violent Left Says They Want A Civil War: Antifa Forming A ‘Red Army’” within which they take a look at one possible glimpse of the future with one group that has sprung up that is supporting the Obama/Bush/Clinton establishment actually having the nerve to call themselves ‘anti-fascists’ when they resort to fascist tactics to silence their critics. And as the Truth About Guns story tells us, now they’re arming up for war. Let’s look at the event from a military perspective. Many from the right-wing side, including the fascists, were well armed and equipped. While this makes them dangerous, their tactical strength is overshadowed by their strategic weakness. All their weapons and their fighting condition mean absolutely nothing without support from the broad masses of people. Regardless of their current lack of popularity a fascist populist movement is still a threat and backward elements of society are moved to become fascists during economic crisis. This is the main reason why we oppose fascist’s presence or any attempts on their part to organize. Our principle is that when you go against a class enemy you hit him—that if you do not hit him he will not fall. The fact that no fascists were harmed in the making of this “counter-protest” only proves that the main organizers have no stomach for antifascism—for us antifascism is concrete—it does not mean simply voicing a disagreement it means stopping fascists in their tracks and hurting their efforts to the point where they stop organizing. On the basis of our principled united front work, fascists and their collaborators can be drowned out, run out, routed, beaten bloody, and even annihilated. These are our principles and we aim to hold them to the very finish. If you think the remarks from the Red Guard Austin, Texas sound just like something a fascist would do, attempting to silence their opposition by using force, you’re not the only one. What does antifascist unity look like? 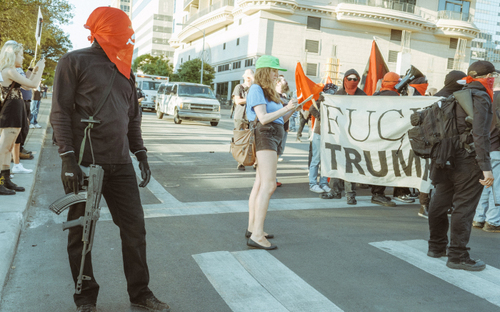 It is time for Austin to stand up, to shake off bad leadership trying to impose itself on antifascism and come together under a better model of actual resistance and not token performance. When we organize and lead actions the fascists do not march every step they take is met with physical confrontation and they are bombarded from all sides. We are willing to work with, and accomplish temporary unity with anyone who can be united with; we simply will not liquidate our leadership behind anti-communists, Democrats or social-democrats. Antifascism is in and of itself neither Socialist nor Communist but it must not be Anti-Communist. Communist leadership of a united front must not be liquidated. That is, our collaborations with those who genuinely wish to defeat fascism must not come at the expense of our own ability to fight fascism, or our ability to grow and expand strategically. While understanding the need for certain tactical unity against fascism we understand that antifascism is just one part of our overall revolutionary work. We will not change our color as Communists; we will not liquidate our program or allow cessation of ideological and political struggle. While we will unite first, we will not fail to criticize second. Those who are worthy of the sharpest criticism are the very same ones who frame any and all critique as a personal attack and cannot self-criticize. On September 2nd on ANP, Susan Duclos put out a story titled “What The Heck Is Going On At CNN? They Are Now Promoting Violence And Claiming Antifa Is ‘Perceived As An African-American Organization,’ Which Is Fake News” within which she broke down for us several different recent attempts by CNN anchorpeople to paint Antifa as not only an ‘AfricanAmerican’ organization but justifying antifa violence against President Trump supporters because ‘antifa is on the side of what is right’. Actually going so far as to claim that there is a distinction between violence carried out by antifa and that carried out by President Trump supporters, we get an outstanding breakdown of CNN’s attempt to justify antifa violence against law-abiding President Trump supporters in the first video below. Mixing clips from a recent CNN show segment in which they attempted to ‘normalize’ antifa violence against so-called ‘white supremacists’ by claiming ‘fascism’ must be stopped now with many antifa members claiming violence is absolutely necessary to do so, as Susan pointed out within her story, CNN and the mainstream media rarely report upon white antifa violence carried out upon black or gay President Trump supporters because that would destroy their narrative. Yet as our videographer tells us within his video, if we continue along the same track that we are on, with more and more members of antifa calling for arming up and violent resistance, there may be nothing that can stop a civil war from breaking out in this country in the months or year ahead. And as our videographer tells us, that may be exactly what ‘the resistance’ at the top, Obama, Clinton, and the Democratic party, want and need, to get rid of President Trump and bring back their slowly crumbling ‘new world order’. So now we know what ‘the resistance’ really is. It’s the establishment. It’s the old political order. It’s that late 20th-century political set, those out-of-touch managerial elites, who still cannot believe the electorate rejected them. That is the take-home message of the bizarre political spectacle that was the burial of John McCain, where this neocon in life has been transformed into a resistance leader in death: that while the anti-Trump movement might doll itself up as rebellious, and even borrow its name from those who resisted fascism in Europe in the mid 20th-century, in truth it is primarily about restoring the apparently cool, expert-driven rule of the old elites over what is viewed as the chaos of the populist Trump / Brexit era. The response to McCain’s death has bordered on the surreal. The strangest aspect has been the self-conscious rebranding of McCain as a searing rebel. In death, this key establishment figure in the Republican Party, this military officer, senator, presidential candidate and enthusiastic backer of the exercise of US military power overseas, has been reimagined as a plucky battler for all that is good against a wicked, overbearing political machine. ‘John McCain’s funeral was the biggest resistance meeting yet’, said a headline in the New Yorker, alongside a photo of George W Bush, Bill Clinton, Hillary Clinton, Al Gore, and soldiers from the US Army, the most powerful military machine on Earth. This is ‘the resistance’ now: the former holders of extraordinary power, the invaders of foreign nations, the Washington establishment. In the 2nd and final video below, our videographer takes a long look at antifa, their fascist tactics and what he believes is their overall purpose, to destroy anything related to Western civilization, with many antifa clearly not understanding that what they’re doing is the work of fascists and the outgoing establishment. This entry was posted in Communism/Marxism, Democrats, U.S. and tagged Antifa, Communists, Democrats, George Soros, Obama, Terrorism. Bookmark the permalink. The US is much like Weimar Germany (that was run by Jews) in the 1920s. We may see running battles in the streets of US cities much like in German cities in the 1920s (when the communists were fomenting revolution). The 2 parties in the US? On the one hand, we have the Marxist Leninist Democratic Party and on the other we have the Trotskyite, neocon (Zionist) controlled Republican Party. Both are bad for America. The true resistance voted for Donald Trump for president. If he had lost, then there would have truly been an uprising reminiscent of the first civil war. America will never go down without a BIG fight.